Why “Gemini” (Twins in Hebrew)? There are several places in the Bible in which “Twins” are mentioned. One of them is Shir Ha’Shirim (Song of Songs), which says, “Thy two breasts are like two fawns that are twins of a gazelle, which feed among the lilies” (Ch 4:5). What is the connection between the breasts and Twins? The Zohar explains that these terms represent the essence of two, which are one. This is the connection between the right column (the desire to share) and the left column (the desire to receive). The right hand in the human body represents the Sefira of “Hesed” – right column, and the left hand represents the Sefira of “Gevura” – left column. The breasts represent the central column which creates circuitry, balance and wholeness, and the ability to connect both left and right columns in harmony, two different entities into one. Gemini (Twins) is the third sign of the zodiac in the Hebrew calendar. As such, it symbolizes the power of the central column which is always represented by the number three. The power of the central column is what allows the flow of life; it is the secret of true love and social balance. The Kabbalists discuss the existence of the three column system (right, left and central) as it is represented in the physical world, in the bodily fluids of the human female. The blood that courses through her body is the color red, which symbolizes the left column (Sefirat Gevura), the energy of the desire to receive. The Milk which is produced in her breasts is white in color, which symbolizes the energy of giving and loving, right column energy (Sefirat Hesed) which is the power of sharing. The power of Gemini lies in its ability to take the positive and negative, connect them together, turning selfishness into giving. This is also why according to tradition we eat dairy on Shavuot, because this holiday is all about connecting to the power of the Torah, the ability to transform and to balance. So, we left Egypt on the full moon of Aries – The month of Nisan. As a side note, according to astrology, Aries is symbolized by the egocentricity of a little child. As soon as we left Egypt we began the process of counting the Omer, the 49 days between Passover and Shavuot. This was all to prepare us, to receive the Torah (the two tablets of stone on which the Ten Utterances, know by mistake as The Commandments, were engraved) on Mt. Sinai in the month of Gemini. It is no coincidence then, that there were two tablets, given in the month of duality (Gemini), which is symbolized by the energy of two becoming one (as we learned in the previous paragraph). Rabbi Akiva explained this most eloquently when he said that the whole Torah in brief is, “…but thou shall love thy neighbor as thyself…” (Leviticus 19, 18). Again in order to live this reality of unity, the consciousness of two becoming one, must be prevalent, and that’s the power we receive in the month of Sivan (Gemini). This is the power of the central column. 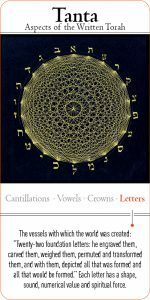 Kabbalah suggests a different interpretation of “Kokhav” (a star). If we divide the word ” Kokhav ” (כוכב), the numeric value of the first two letters (כ”ו) is 26 which is also the numerical value of one of God’s name – The Tetragrammaton (the heavenly power of giving). The numerical value of the last two letters of the word “Kokhav” is 22 and that symbolizes the 22 letters in the Hebrew language, which are the basis for the foundation of the universe (each of them represent an energy frequency and they also represent the Shekhina, our earthly ability to receive). Hence, ” Kokhav ” symbolizes a connection between God – the sharing aspect of The Creation and the Shekhina – the receiving aspect of Creation, a connection between right and left columns, between heaven and earth, between the spiritual and material, and because of this, we received the Torah on Mt. Sinai. This monumental event, according to tradition, symbolizes a wedding between The Nation of Israel and God. This is actually the connection between the upper and the lower worlds, Male and female, body and soul, and that turns them into one, unified and complete entity. In the Sefer Yetsira (first book written by Abraham the Patriarch), it is said that the seventh letter in the Hebrew Alphbet (ז) created Gemini (the month of Sivan), and the twentieth letter (ר), controls the planet Mercury. Combining them together creates the word Raz (רז), meaning – secret. The Kabbalists teach that the secret of life is encrypted in the energy of Gemini and the planet Mercury, the ability to balance different desires, drives, urges and people into a whole, into one complete entity – this is the secret of love. The element that rules Gemini is Air, which is also central column energy. Six hundred thousand people received the Torahon Mount Sinai in the month of Gemini (Sivan). According to the Zohar, each and every one of them experienced it differently and heard something else, and yet they all got it right. Gemini allows us to see and understand all the different angles and connect them into one multi-dimensional picture, and this is the secret of the Torah and the central column. As mentioned above, the Hebrew letters of the month create the word Raz (secret), and this is why Gemini’s are highly attracted to confidential information. Also, the numerical value (Gematria) of Raz (207) equals to Or (light), which indicates the enormous amount of hidden light in this sign. The special connection between the dominance of the air element in Gemini, and the planet Mercury, is characterized by speed, flexibility of thought and quick thinking. The metal mercury is a symbol of speed and planet Mercury’s year is only 88 days. All of this gives Gemini’s the ability to be as quick as lightning. Gemini’s are the symbol of modern communication – fast and detailed. The speed of Gemini is energetic, infectious and brilliant. On the other hand, however, if this energy is not harnessed properly, Gemini’s can appear superficial, shallow and jump to do things at a moment notice, without thinking things through. Their speed is the strength and weakness of the Gemini people. Their ability of understanding a situation, digesting what’s happened and responding quickly in real time is where they shine. The power of Gemini lies in its dual nature – the ability to see things through two or more “sets of eyes” and to change, adapt to meet the changing situation. The speed of Gemini’s thoughts gives them the power of persuasion and they can communicate with people in an unusually successful manner. Therefore, their greatest talent is in sales. Also, they have the ability to change their perspective instantly and access and present a new approach as if their prior approach never existed. They are also great media people and do well as reporters. Gemini’s are typically not materialistic, as for them, ideas and information is the property which they collect and store religiously. Aside from being friendly, charming and entertaining, Gemini’s have a deeper side. Their quick and flexible thought process is derived from a deep, inner source of lack. This is what pushes them to move so fast, as they are really on a quest for deep and internal satisfaction. The twentieth Hebrew letter (ר = Reish), which created the planet Mercury, represents lack. Reish in Hebrew means poverty. The power of spring, astrologically, is the element of the fire, which symbolizes the ego and selfishness. Therefore, when Gemini’s are missing spirituality, expressed as commitment to others and true love, they will fall into superficiality, selfishness and emptiness, which they will try to fill with endless wanderings in the fields of information and relationships. They’ll only be truly satisfied on a deep and soul level when they will have a deep commitment to values, such as; connecting with the spiritual world, connecting with others, connecting with themselves, forming a connection between the physical and non physical worlds and connecting their body and soul. For additional study on Hodesh Iyar and other months enter Live Kabbalah University.